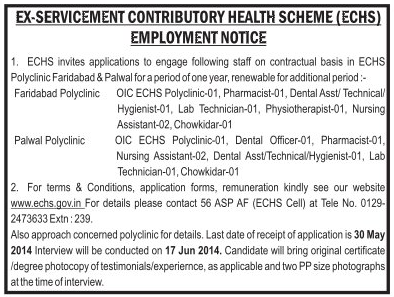 NOTICE FOR WALK-IN-INTERVIEW FOR JUNIOR RESIDENT ON ADHOC BASIS. residents are available for a further period of one year maximum on adhoc basis. Dental and Prosthetic SurgeryMDS in Prosthetics and Crown and Bridge. Fees Lib.Fee & Security Deposit Reg. Employees’ State Insurance Corporation is a statutory body constituted under an Act of Parliament (ESI Act, 1948) and works under the administrative control of Ministry of Labour and Employment, Government of India. Employees’ State Insurance Corporation proposed to recruit the teaching faculty i.e Tutor in ESIC Dental College & Hospital, Sector-15, Rohini, Delhi-85 on direct recruitment basis. Essential:- 1. A recognized BDS degree of Indian University or an equivalent qualification with at least one year experience, preferably in a recognized hospital. 2. Must be registered with Dental Council of India. Highlights: This program is specially designed to equip today's practitioners with clinical skills and knowledge that are rarely emphasized in graduate dental school. This course will enhance both time tested and contemporary techniques that form the basis for esthetic and functional success of restorations in the mouth. Quality information offered in a systematic step-by-step manner is the aim of this program. This learning experience in clinical prosthetic dentistry should arm you with the weapons of theoretical, technical and practical applications to solve all restorative problems, simple or complex.